SAVE UP TO 70% ON ALL YOUR TRAVEL RESERVATIONS!! 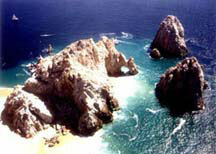 Cabo San Lucas, where the sea, sun and desert join to cast an air of mystery and romance over all who visit. Cabo was once a tranquil fishing village and, in times long ago, a hangout for pirates. Although no longer the fishing village of old, and not many of the old pirates are seen around town any more, the magic of Cabo remains. Cabo is still small and charming by any standards, with a population of under 25,000. They do have 4 stop lights now. And with the number of activities available to the visitor, you could easily imagine you are in a giant amusement park. Cabo has come of age. Located at the southernmost tip of the magnificent Baja peninsula, Cabo has been blessed with what many describe as the perfect climate. Average year-round temperature is 78 degrees, it is a little cooler in the winter and a bit warmer in the summer. For years Cabo was the remote playground reserved solely for private yacht owners. They flocked here to be near "Marlin Alley", as the waters around Cabo have often been described. The name is well deserved, as Cabo San Lucas is the undisputed billfish capital of the world. But Cabo is far from remote these days, and the attraction of this magical spot is no longer limited to marlin fishing. Cabo can be, many different things to people. C abo San Lucas has become know as the perfect vacation spot for the entire family. Cabo can be as quiet, romantic and relaxing as any secret hideaway. It can be as lively as anyone can possibly imagine. If your wish is to enjoy a quiet candlelight dinner, they've got that too! Did I mention the beaches? They've got beaches! From the main beach at Playa Medano, one of the great people watching spots in the world, to quiet Playa del Amor (Lover's Beach) a short boat ride away. There are the countless quiet coves, where you'll most likely find no other footprints in the sand. Miles and miles of deserted beaches, on both the Pacific coast and the shoreline of the Sea of Cortez, make for an unbelievable vacation area; the kind beach lovers dream of. Snorkeling at either of the beautiful bays of Santa Maria or Chileno seems to be the very reason snork eling was invented. Los Cabos is home to five world class, championship golf courses, with another on the way. Three of these were designed by Jack Nicklaus, one by Robert Trent Jones II and one by Pete Dye. Cabo del Sol, a Nicklaus creation, which skirts the shore of the Sea of Cortez, has been called one of the five most beautiful courses in the world. Nearby San Jose del Cabo is the home of a delightful nine hole public course. Golf has quickly become a major attraction here. Where else can you catch a marlin in the morning, play eighteen holes and still be home by early afternoon? Water sports are everywhere, and the waters of the Sea of Cortez are a luxurious 80°-85°F year-round. Restaurants range from the local taco stands (our favorite) to the panoramic views of their cliff-top restaurant. Luxurious beach clubs line Medano Beach, such as world-famous Nikki Beach at the ME Cabo resort. Nightlife can be wild and crazy, with Californians drunk to high heaven on their spring breaks. Hang upside-down at the Giggling Marlin, get crazy at Sammy Hagar's Cabo Wabo, or dance the night away at El Squid Roe or Kokomos. Don't miss our other pages on Los Cabos! Visit Top 100 Travel Sites to cast your vote for Johann & Sandra's Cabo San Lucas!